The tale of a shark gone rogue who has started to munch down on civilians is not an original story, but then I don’t suspect that originality was high on the requirements list when Bait 3D was clunked together. Instead, there was a much larger demand for melodrama, forced character depth, and shock tactics. It’s the sort of movie that comes across as a funny parody, except that it is entirely unaware of it, and so becomes an even bigger tragedy. 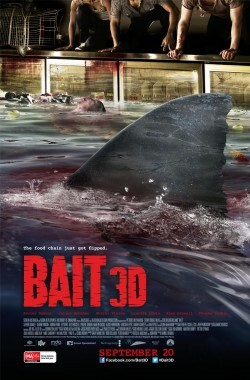 Bait 3D is set on the Gold Coast and was funded with tourist dollars from the Queensland government. Between this and funding Big Brother the Queensland government doesn’t seem to be too interested in portraying itself in a positive light, or attracting quality tourists. But, putting the state government’s poor funding decisions aside, let’s move on to the film itself. I have never seen this many dramatic yells of ‘no’ in my life of watching films. It just got to the point where the whole theater was full of laughter and the utter ridiculousness. Accompanied with the fact that hands were thrown in the air, people fell to their knees, and their faces were screwed up in over-the-top pain, it was firmly stuck in the realm of ridiculousness. Day one of acting school surely taught these actors that it’s the quiet pain that shows in the face that says the most, not screaming at the top of your lungs while tipping your face to the sky and clenching your fists. So was it the writers, directors, or actors fault? Who knows, perhaps all three. The writing was certainly not something that could have been saved. The amount of groan-inducing lines far outnumbered the natural sounding ones (this is ignoring the premise entirely, which I will get to shortly). The attempts to give the characters back story and depth was clunky and out of place – one character’s reveal that her mother had died while she was off gallivanting was entirely out of place and felt like a copy-paste job with no need for it. And (excepting one entertaining relationship), the conversations that took place between people felt odd and unnatural. The result? You just didn’t care about the characters. The whole movie I was rooting for the sharks and when – SPOILER ALERT – people ended up surviving I just felt cheated and bored. There was no leaping into the air and fist-pumping as this movie might have felt was the appropriate response, no weeping and clutching at those around me in relief, nope. Guess what, I don’t go to a shark (or any other big, bad animal) movie to see people survive, I go to see how inventive the sharks can be in gobbling them up. Particularly if the people in question are annoying and unrelatable. There was one exception to the rule. Lincoln Lewis’ character Kyle, who wasn’t angsty, wasn’t over-emotional, was just a funny flawed guy who didn’t really care all that much. This type of character I can get on board with, because we see it all the time, it’s real, and he actually gave a pretty entertaining performance. As odd as it is, his shallowness was the best part of his character. Shallowness is what you want from characters in a movie like this, shallowness, funny quips, and some good chemistry with those he’s acting with. He’s the only one who didn’t come across as wooden, boring and unrelatable. By being shallow he somehow gave his character more depth than the rest of them did. In contrast, Julian McMahon, who I was expecting some halfway decent attempt from, was just terrible. It isn’t entirely his fault though, his character’s dialogue was horrible, and it didn’t matter how much glowering or ‘bad boy’ charm he tried to bring to the role, it was just a pain to watch. And there are just some really, really, really ridiculous plot points that seem to have been researched by an intern on Wikipedia. Or not researched at all. Because who lets reality get in the way of filmmaking? This movie seemed to rely a lot on special effects and dead bodies, although after you’ve seen the second mangled body drift across the frame it sort of loses its effect. So after the fifteenth you’re feeling bored with the whole thing. The most impressive, and actually enjoyable part to watch, was when the tsunami swept through the Gold Coast. This seems to be where all the funding went to, and it looked great. Personally I could have just watched that, seen a shark eat someone, and would have walked out of the cinema a lot happier. Unfortunately there’s way too much build up to it, and way too much happening after it, so the adrenaline you get from seeing a wall of water tear through a city, ebbs fairly quickly. And don’t even mention the fact that it’s in 3D. The most it adds to the movie is a few cheap shots at making animals or blood ‘fly towards you’. 3D is something that I think is overused these days, and this movie is a prime example. If the filmmakers had taken a moment to ask ‘why’ about a lot of the things they were doing, I suspect the end result would have been vastly different. The soundtrack is just as over the top as the writing is. It doesn’t sit nicely in the background complementing the action or mood of the scene, it doesn’t add to the scene or draw you in, it shouts in your face that you are meant to be feeling a certain feeling at that time. Like people sinking to their knees and yelling ‘no’, it yells ‘feel sad’, ‘feel scared’, ‘feel happy’. It made me feel like slapping the soundtrack in the face and saying ‘no, I do not wish to feel this things and you can’t make me’. The fact that it is so blatantly obvious in its purpose makes you feel (if you weren’t already repulsed by the acting and writing) the opposite of what you are meant to be feeling. Don’t even get me started on the accents. One particular character sounded like a mangled version of Blinky Bill. Others hovered between American and Australian, and barely any had natural sounding accents. But sure, let’s perpetuate incorrect stereotypes about Australians in the international sector some more. Bait 3D will have you laughing in your seats and, if nothing else, it’s something you can laugh at with your friends. Unfortunately that is not what it intended at all, so the whole purpose of the film is a huge hit and miss. But if you feel like going to laugh at a terrible movie, then I certainly recommend Bait 3D.